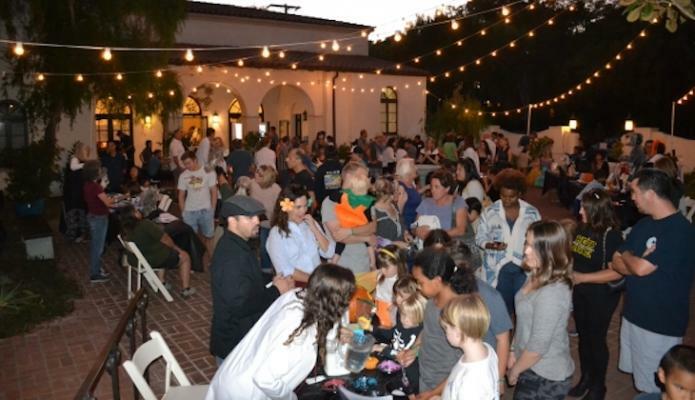 The Knox School of Santa Barbara got spooky on Friday, October 19, 2018, at their second annual Halloween-themed STEAM night! Over 180 attendees enjoyed hands-on activities at booths from 30 local organizations, including Eyes In The Sky, Santa Barbara Museum of Art, UCSB’s Physics Circus, Santa Barbara Hackerspace, UCSB’s Brainiacs, Flir Corporation, Eye N Vision Care of SB, White & Grube Orthodontics, Santa Barbara Zoo, UCSB’s REEF, SB Beekeepers Association, UCSB’s Materials Research Lab, Santa Barbara Museum of Natural History, Santa Barbara Botanic Garden, Terrific Scientific and Art from Scrap. The focus of the event was to expose the Santa Barbara community to Science, Technology, Engineering, Arts and Math (STEAM) and to show that these disciplines are accessible and fun! Hogwarts fan, Lucien Dempsey, poses with an owl Harry Potter-style from Eyes In The Sky. Elena Beckman experiments with a wind tunnel (built by Knox students in their STEAM class in collaboration with MOXI). The Knox School of Santa Barbara celebrated its 5th year earlier in 2018, having proudly served Gifted & Talented students in first through eighth grades since 2013, and extended its program to Kindergarteners in Fall 2018. For more information, visit www.KnoxSchoolSB.org. Change STEAM to STREAMPH for Science, Technology, Religion, Engineering, Arts, Mathematics, Philosophy, History; a more complete acronym.